Bro Tip #2: Emotions. SHOW THEM! Don't be that tough bro who doesn't show your more sensitive side. Let your emotions flow like that raging river you rafted down at Scout camp. The more you can open up to her and show her your softer side, the better your chances of making it to the Home Town Dates and meeting the parents. This is Drew. Follow Drew's example. Also, if you don't feel like showing your emotions of love in the form of wet, salty tears, you can always follow Chris' lead and do it with really awful "poetry." Because when you do, she'll go "awwwwwwww!" I know what you're thinking. Why would I share a really depressing story from my past? The answer, honestly, is I have no freaking clue. But every one of the bros who made it to the Home Town Dates all shared depressing, even tragic, stories about their past. For example, there's Drew. 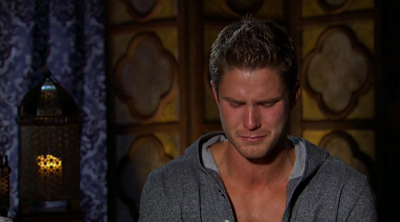 You know, crying Drew. His tragic story? An abusive alcoholic father. Other's tragic stories ranged from terrible cheating ex-girlfriends to the loss of family members. All of which, for some reason, when told in a candle-lit setting, seems to really pile on the romance ... I guess. And if you're still unclear about what it means to be there "for the right reasons," well you're in luck because The Bachelorette went ahead and did this. Again, you guys. I watch this (and live tweet every Monday night @KJinDC7), so you don't have to.